1 photograph : b&w ; 11 x 16 in. - 2 photographs : b&w ; 17 x 22 in. 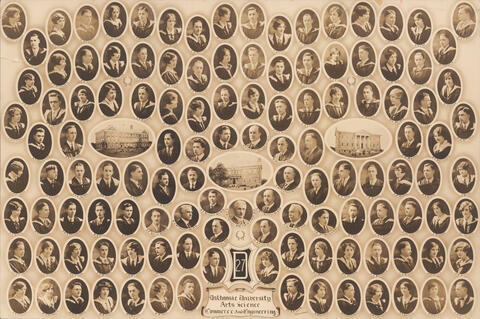 File contains three copies of a composite photograph of the 1927 faculty and class of the Dalhousie University faculties of Arts, Science, Commerce, and Engineering. 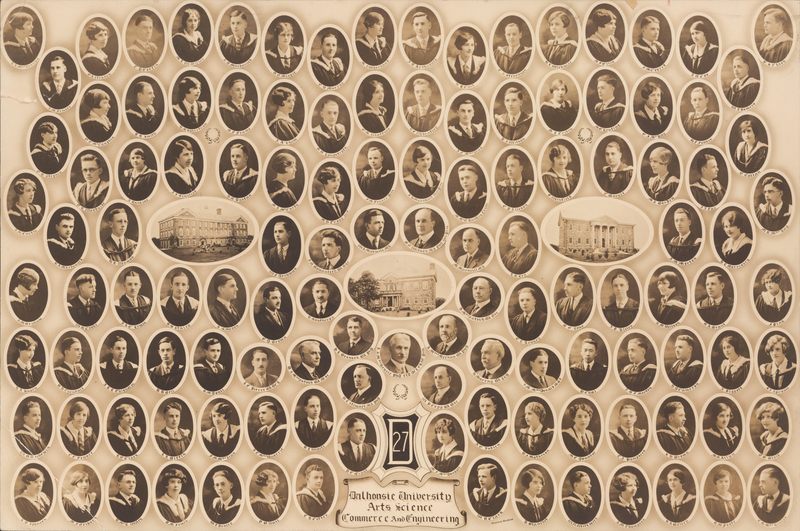 The photograph consists of portraits of A. D. Johnson; M. F. Eriksen; R. McK. Willes; D. M. Irwin; W. L. Henley; P. D. Vail; C. H. Cotter; W. R. Clark; K. Blanchet; W. N. Wickwire; A. M. Thompson; R. A. Bailey; R. M. Foote; C. G. MacKinnon; W. G. Duchemin; C. C. Fraser; R. E. Clark; A. A. Giffin; F. M. MacLean; J. T. MacQuarrie; H. L. White; H. C. Grant; M. J. MacDougall; A. E. Jubien; H. J. Matheson; M. C. Donahoe; T. J. Humphrey; S. H. Brown; M. G. Allan; E. E. Blois; H. L. Stewart; W. P. Copp; K. A. Hagen; H. H. Turnbull; J. L. L. Chisholm; H. H. Bell; R. M. Doull; S. F. Pierre; D. S. MacIntosh; H. L. Bronson; A. S. MacKenzie (President); A. MacMechan; H. Murray; J. M. MacDonald; H. Chai; G. J. F. Morton; H. D. Cameron; J. Piggott; A. J. Sproull; J. M. Graham; W. G. Cooke; J. A. C. Lewis; H. G. Stairs; A. G. Mahon; E. D. Brown; R. Gautheron; D. MacIntosh; C. L. Kenney; G. E. Lowe; G. A. Grant; J. Pink; A. M. Wilson (Honorary President); J. P. Kieley; R. A. Macdonald; H. R. Wyman; W. F. Dechman; J. N. Gomanlock; W. A. Maxwell; G. E. Wilson; M. Macneill; A. G. Ley; J. M. Morton; H. L. Morrissey; J. M. Curtis; E. R. Woodside; J. Rankine; J. I. Olmstead; H. G. Dustan; M. A. McCurdy; M. H. Troop (Secretary); F. M. Fraser (President); A. H. Marshall (Vice President); M. McG. Rankin (Treasurer); E. P. Allison; F. Winfield; C. G. Gavsie; M. A. Borden; J. J. Fay; M. R. MacKay; E. G. Stephen; E. T. McCaughlin; D. R. Smith; H. M. Robertson; G. F. Frame; J. A. Shaw; G. V. Langstroth; E. M. Schaffner; D. F. Wheatley; A. F. MacLean; D. S. Wilson; M. L. Trites; M. E. Keating; E. I. McKay; H. F. Feaver; E. Callan; K. A. MacLennan; J. M. Fraser; E. A. Stephen; T. H. Coffin; M. L. W. Miller; A. G. Macdonald; G. G. Mingie; E. D. Murray; M. Sutherland; J. D. Archibald; V. R. Card; C. S. Stevenson; H. L. Wickwire; M. F. Ellis; F. M. Covert; J. G. Cox; W. L. Bowers; and E. S. Clark arranged in several rows around photographs of three buildings. Two of the copies are mounted on matboards. Both matboards are worn around the edges and the corners of one matboard are damaged. The other matboard is water damaged long the left side. Lower left corner of the third photograph is bent.